I know it's another bird photo, but just a little different. My wife and myself were sitting in the conservatory this evening when this visitor arrived, it strutted around the dining room and kitchen for about half an hour then flew away. 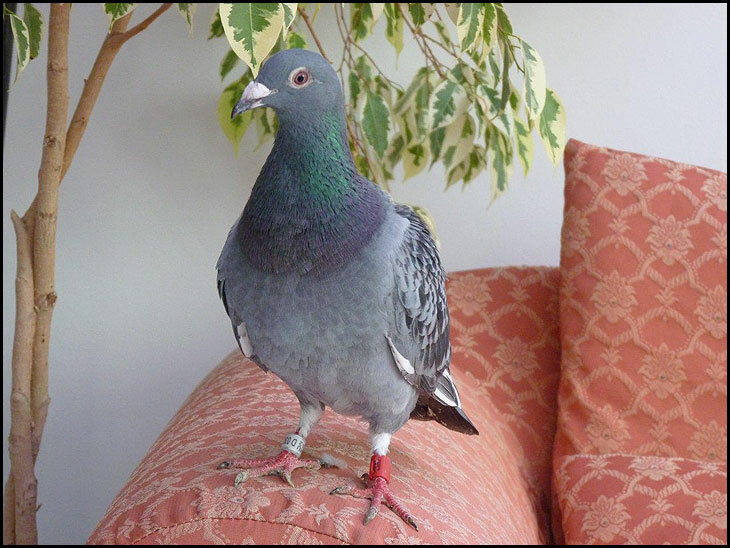 It was ringed so I assume it's a homing pigeon that lost it's way. Lovely looking bird, I hope it did not leave a deposit after its visit. It might be eying that tree up for a nest??? I`ll bet DH mentions pigeon pie, Harry !! I was sat in my lounge the other day and heard a `thud` which was a large bird hitting the window !! How do pigeons and other birds, particularly swallows, manage to fly in flocks without colliding I wonder. Ken R, these flamingo`s leave huge `deposits`!! It’s me you’re looking for? And it can be the meat? Nice one Harry, Sod the morons. [Show me the way to go home]..... good photo,Harry. "morons" what do you mean ron d ? Looks quite happy being photogrpahed in the house. Beautiful shot..I can never understand why some people call them the rats of the sky..they didn't say that when they were saving thousands of lives flying to and fro during the war...they are a beautiful bird..and of course one of God's creatures. My dear Mum used to say ,it was bad luck iff a bird came into the house(wild birds) that is. I wonder why people fancy pigeons with all other animals and birds keepers you are a breeder. Famous pigeon fanciers the Queen and Jack Duckworth. It does no harm to feed a racing pigeon when they pop in for a rest as they are usually quite hungry if they are lost.Nice pic.Harry,reminds me of the time when there were always a few chaps releasing pigeons down the canal bank on their practice run before a race. Click on utube and listen to Dana singing Skyline Pigeon, do take notice of the words. Thanks for the interest all. I agree With you Ron I like the bird pics, Dave it wasn't hungry,it ignored the bird table, (which I have extended so that the White collared Doves could land on it) and came into the house, it did have some water though. Lizzie yes it is a Ficus.